Well, again it has been a long time since I last posted. I have been working on my blog setup. Learning how to do different things, experimenting. All paper and stamps I used to create my blog background, header, etc. were using Stampin'Up! 's My Digital Studio. 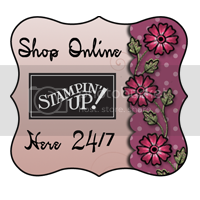 It is super easy to use and you have a few thousand of Stampin'Up! papers, embellishments, stamps, punches, etc. It is WONDERFUL! Check out the short video here on the left. Click on the link above if you would like to order it.